The most disgusting feature of a musical movement that is in evidence is the great number of bands releasing albums. Of course some are really excellent, but we always have those ones that aren’t worthy of being heard, and this second group is greater that the first one. Then, to hear something really good becomes a hard task to be done. 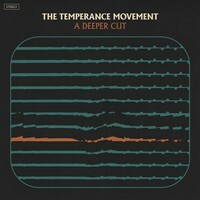 And let me tell you: the Scottish quintet THE TEMPERANCE MOVEMENT has talent, but “A Deeper Cut” (their latest release) doesn’t show something that we didn’t hear before. Explaining: this album presents what we can hear on albums from bands from Classic Rock/Hard Rock from the 70’s that mixes Rock, Blues and Folk music (like AEROSMITH, LED ZEPPELIN and others), what isn’t the problem. The main feature that really is annoying is that their melodies aren’t different from the past. There’s a kind of reverence for the past that don’t allow them to explore new musical possibilities. It’s not bad, but it’s like many other albums we hear every day. On the production, a good point: although their music sounds organic and vigorous, they evaded the use of a moldy sound quality. No, here you can be sure that the band, along with Sam Miller (production, recording, mixing) and Geoff Pesche (mastering) did a fine work. All is sounding clean and good, so the organic feeling comes from the instrumental tunes they had chosen (the simpler, the best in their case). The problem resides in their songs. As I told above, you’ll hear many things of the past, but it’s hard to find something that bears THE TEMPERANCE MOVEMENT’s trademark music. Basically, it’s a clone, besides hearing songs as “Caught in the Middle” (a fine Hard Rock song with a catchy melodic line), the Bluesy Rock scent of “Built-In Forgetter”, the strong rhythm of “Love and Devotion” (this one is the purest LED ZEPPELIN heavy Rock sound you can hear), the Folk/Blues ballad “A Deeper Cut”, “Beast Nation” and its tender atmosphere, and the Hammond parts of “Higher than the Sun” won’t be a hard time. Nothing different from the usual, but they have talent to do something better than “A Deeper Cut”.